to view, and to contemplate. The cone flowers are departing and the goldenrods waiting to make their entrances. A brilliant garden designer placed coreopsis and blackeyed Susans in a site where, in the morning, the sun shines between buildings directly on them, while the surroundings are in shade. The Joe Pye and orange butterfly weed must be attracting butterflies, but I missed them. My favorite feature in the new section is designed by Susan Sze a startling, delicate but arresting structure on either side of the path that is partly wildlife feeder, partly bird house village, and partly an abstraction of the cityscape. My photos can't do it justice, go see for yourself. The last section of the High Line, the spur, running west from 30th St and curving into the Rail Yards, is still to be constructed, but you can see the path if you peek through the chain link fence. I've saved the topic of the dreaded High Line LAWN for a whole separate diatribe. It is a great place. I like nature, and it would be nice if there is a place of nature in the city. I actually love that lawn. It's really, really soft and gives people a lie-down break. I'm not fundamentalist about lawns, especially in a place designed this well. The bird house installation makes me worry for the birds. I can see them hanging by their little necks on those wires. 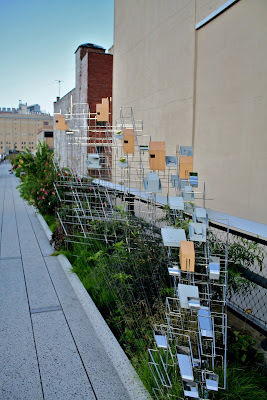 I visited the High Line for the first time a few weeks ago (I grew up in Washington Hts but was visiting from Conn.) I hope that the design for HL's new section will integrate some of the remaining track structure at the current northern terminus . The contrast between the HL's new design elements which repurpose it for leisure and contemplation, vs. the the patina of the wood and metal of the old RR track structure as it curves East is both beautiful and essential. For me, that contrast underlined the Genius of the Place : I could see right from that spot how central a role 19th cen. New York City's two main transportation arteries ( the Hudson and the Railroads,) played in its growth . As you stand looking at that RR structure, you can picture all that STUFF coming into NYC (or the US for that matter)) off ships or trains, and finding their way into the country's fabric. A PBS documentary on F.L. Olmstead and Central Park and it showed that in 1881, CLeopatra's needle (almost 69 ft long and 220 tons!) came by ship from Cairo to NYC, and was floated up the Hudson The steps and pedestal were unloaded at the 51st street dock but the 96th st dock was the only place deep enough to take the wt of the Needle so it was unloaded there....Then, it took 6 MONTHs to get them across 51st St & up 5th avenue on a specially built trestle bridge all the way up to 82nd where it finally entered Central Park. The Needle we see today in Central Park, one of a hundreds of amazing things in one green space, is there because of what another section of NYC that is only now becoming green space made possible a century earlier... The city is an integrated ballet of industry and beauty that not only spans space, it spans time. By emphasizing the utilitarian nature of the HL's older structures the designers could make an even more compelling case that New York is a city forever in flux; that it gives each new generation of New Yorkers a landscape for work, for art , and for leisure enriched by civic memory and limited only by their imaginations. New York City is ALWAYS Something Old, Something New, Something Borrowed and Something Blue.